Despite the Prime Minister’s assurance of no punitive action and protection of their interests, due to the mounting pressure to call off the stir from various quarters, protesting medicos, showing circumspection, have begun parleys to decide whether their fast will continue or not. 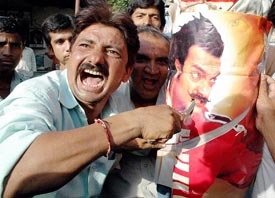 Will preventing the screening of the film “Fanaa” in Gujarat amount to denial of the right to freedom of expression? Dismissing suggestions that the Indo-US civilian nuclear accord was in serious trouble, the Bush administration said today that though it was ready to show some flexibility to accommodate the views of Congress members, it was not prepared to impose conditions or introduce legislations at this point that can “break” the deal. India and the US have exchanged the drafts of the agreements that will enable the two countries to implement the bilateral civilian nuclear energy deal, Foreign Secretary Shyam Saran said. It was movement forward on the Sir Creek issue today, but in a typical India-Pakistan style. At the end of the two-day talks at the level of Surveyors-General of the two countries, India and Pakistan today agreed on an early settlement of the land boundary in the Sir Creek area and the maritime boundary and to conduct a joint survey of the Sir Creek and adjoining areas and waters between November, 2006, and March, 2007. It seems like a curriculum for a class on protocol and decorum. The teacher is the Chief Secretary of Punjab, Mr K.R. Lakhanpal. 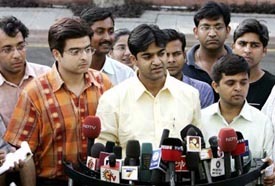 The students are not the usual ones but are bureaucrats and police officers of the state. The south-west monsoon has hit Kerala six days ahead of its usual onset over the Indian mainland. Satellite pictures released by the Indian Meteorological Department (IMD) showed monsoon active over a swathe of South India. “Fanaa” and “The Da Vinci Code”, two controversial films, were released in theatres across the country today, amidst protests in Gujarat and other places.